The Mt. 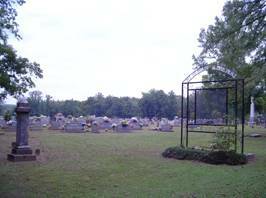 Hebron Cemetery is located west/northwest of Collinwood in Wayne Co. To reach the cemetery, turn west just south of Collinwood, TN onto highway 203. Travel 5.3 miles to the Cromwell Crossroads community, turning right onto Pea Ridge Rd. Pea Ridge Rd. becomes Rayburn Creek after about 3.5 miles out. Continue from Cromwell Crossroads about 9 miles, turning right onto Mt. Hebron Cemetery Road. The cemetery is about .3 mile up the hill. This cemetery is quite old and has a very large number of unknown graves. Some are marked with fieldstone. Many do not have anything marking them. The oldest known birth date is that of Andrew Downing, being born April 5, 1771 & migrated from South Carolina. Decoration day at Mt. Hebron is on Mother’s day each year. Arnold, Hall; b. & d. 28 May 1889, son of J.M. & M.C. Beckham, Arie; b. 28 Jun 1900, d. 01 Dec 1903, daughter of W. Isham & Mary E.
Beckham, Cordie; b. 1888, d. 1971, wife of O.H. Beckham, D.B. ; no dates, Co. “F” 5th TN Cav. Beckham, Earl; b. 15 Dec 1906, d. 12 Feb 1907, son of John F. & Mary C.
Beckham, Milo; b. 03 Sep 1897, d. 28 Aug 1898, son of W. Isham & Mary E.
Beckham, Nolon M.; b. 26 Mar 1901, d. 05 Aug 1902, son of T.J. & E.F.
Beckham, Roy; b. 24 Dec 1892, d. 20 Feb 1893, son of John F. & Mary C.
Beckham, Sarah; b. 11 Jul 1835, d. 30 Nov 1909, wife of T.J.
Beckham, Sarah; b. 11 Jul 1835, d. 30 Nov 1909, wife of Thomas J.
Burns, Alice; b. 22 May 1870, d. 13 Aug 1926, wife of John B.
Burns, Corpl. C.C. ; no dates, Co. “E” 2nd TN Mtd. Inf. Burns, Lara; b. 13 Aug 1866, d. 20 Mar 1926, wife of W.M. Burns, Margaret L.; b. 24 Sep 1922, d. 26 Sep 1922, daughter of E.R. & M.M. Childress, Lunett; b. 31 Dec 1852, d. 13 Apr 1853, daughter of W.T. & C.
Chowning, infant; b. 25 Mar 1909, d. 30 Mar 1909, daughter of E.A. & M.I. Clay, Earl; b. 21 May 1909, d. 17 Jan 1923, son of Ben F. & Lillie P.
Clay, Hubert; b. 27 Feb 1914, d. 22 Jul 1916, son of Ben F. & Lillie P.
Cypert, R. Porter; b. 01 Feb 1885, d. 19 Jun 1887, son of Dr. J.B. & M.E. Estes, Sarah E.; b. 30 Apr 1869, d. 28 Oct 1901, wife of T.W. Farris, Dumont; b. 17 Feb 1890, d. 06 Apr 1918, son of W.J. & N.A. Farris, Nancy M.; b. 14 Nov 1850, d. 16 Sep 1924, wife of W.J. Gentry, Mary E.; b. 05 Jul 1909, d. 19 Aug 1910, daughter of W.C. & S.C.
Griffith, Cordie E.; b. 12 Apr 1879, d. 28 Jun 1880, daughter of E.V. & E. G.
Hill, Elijah C.; b. 19 Aug 1838, d. 13 May 1873Hill, infant; b. 04 Jul 1873, d. 16 Sep 1873, infant of P.A. & M.H. Johnson, Eddie May; b. 07 Jan 1887, d. 13 May 1901, daughter of W.W. & Willie A.
Johnson, Willie A.; b. 16 Feb 1867, d. 24 Sep 1903, wife of W.W.
Lynch, Paul Frank; b. 17 Jan 1922, d. 07 Aug 1929, son of Hardy B. & Mazy C.
Martin, Mary F.; b. 24 Nov 1863, d. 03 Oct 1867, daughter of E.B. & M.R. Melson, Mary Ann; 28 Dec 1958, daughter of Jessie J. & Mary B.
Melson, Mary Bell (Robbins); b. 24 Aug 1929, d. 19 Feb 2012, wife of Jessie J.
Miller, W. Walter; b. Feb 1912, d. Oct 1919, son of Mr. & Mrs. George C.
Morgan, Etta M.; b. 03 Oct 1895, d. 12 May 1940, wife of William I.
Morgan, Irena K.; b. 18 Mar 1864, d. 09 Sep 1901, wife of John W.
Morgan, LeRoy; 23 Mar 1920, son of William Isham & Etta M.
Morgan, Lucy A.; b. 21 Jan 1878, d. 07 Jun 1945, wife of John W.
Morgan, Nellie E.; b. 12 Jun 1946, only date, daughter of Mr. & Mrs. William Morgan Jr.
Murphey, Addie; b. 21 Mar 1898, d. 06 Aug 1899, daughter of A.H. & A.
Murphy, Mary Ann; b. 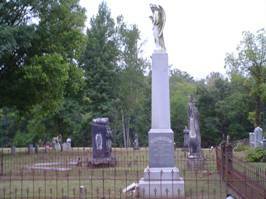 1849, d. 05 Aug 1889, wife of W.M. Parker, Elizabeth; b. 13 Sep 1868, d. 26 Sep 1865, daughter of F. & E.J. Parker, Evaline; b. 18 Nov 1866, 02 Sep 1870, daughter of F. & E.J. Parker, infant; d. 01 Aug 1901, 6 days of age, son of E.F. & B.M. Parker, Ira J.; b. 14 Apr 1899, d. 30 Oct 1906, daughter of E.F. & M.B. Parker, Mary E.; b. 03 Jan 1842, d. 10 Oct 1902, wife of John Y.
Parker, Vio M.; b. 23 May 1912, d. 26 Aug 1912, daughter of E.F. & M.B. Parker, W.F. ; b. 10 May 1867, d. 18 Jul 1869, son of J.Y. & M.E. Parker, William J.; b. 16 Feb 1837, d. 19 May 1867, son of William & E.
Paulk, Clarence B.; b. 17 Nov 1883, d. 30 Oct 1884, son of J.M. Paulk, Emma R.; b. 14 Sep 1842, d. 04 Nov 1881, wife of R.D. Paulk, John S.; b. 03 Jan 1870, d. 22 Aug 1872, son of R.D. & Emma R.
Sherrill, L.B. ; b. 25 Sep 1914, d. 30 Jul 1915, daughter of W.D. & L.J. Shull, Fannie K.; b. 08 May 1853, d. 02 Jan 1944, wife of M.B. Shull, Frank; b. 02 Oct 1830, d. 26 Oct 1896, husband of S.L. Sinclair, E.H.; no information. This appears to be a separate grave as it has a footstone. Sinclair, Eliza (Harbour); b. 11 Apr 1851, d. 30 Jul 1897, wife of Samuel H.
Sinclair, Emma Ethel; b. 05 May 1878, d. 11 Nov 1879, daughter of W.T. & C.A. Smith, Athen L.; b. 13 Aug 1890, d. 29 Jun 1891, son of H.H. & Rebecca J.
Smith, William; b. 01 Aug 1877, d. 15 Aug 1877, son of H.H. & S.E. Stanfield, Emma B.; b. 06 Mar 1882, d. 19 Sep 1883, daughter of J.E. & E.J. Stanfield, Jesse P.; b. 21 Mar 1878, d. 18 Sep 1883, son of J.E. & E.J. Taylor, Cynthia; b. 15 Mar 1861, d. 17 Mar 1895, wife of J.H. Townsend, Mahala C.; b. 21 Dec 1830, d. 18 Mar 1920, wife of Benjamin F.
Unknown, unknown; cannot read, son of J. & E.
Wilkerson, Georgia; b. 15 Aug 1868, d. 05 May 1948, wife of G.R. Wood, Nancy; b. 23 Nov 1835, d. 03 Dec 1886, wife of J.J.
Woody, Mary A.; b. 15 Sep 1839, d. 09 Apr 1908, wife of J.S.